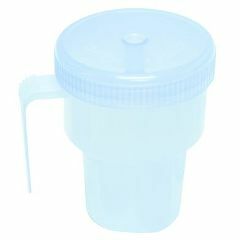 AllegroMedical.com presents The Kennedy Spillproof Cup, 7 Oz. . The lightweight Spillproof drinking cup is ideal for people of all ages with an ergonomic “J” handle. It won’t spill even when turned upside down! It's useable with any style straw and is dishwasher safe. The lightweight Spillproof drinking cup is ideal for people of all ages with an ergonomic “J” handle. It won’t spill even when turned upside down! It's useable with any style straw and is dishwasher safe.